1 x Queen Bed, 1 x Double Bed & 2 Single Bunks, Fully self contained with reverse cycle airconditioning, Free Austar TV, Balcony with Outdoor Setting & Private Balcony. Fully self contained(dishwasher) with 2 x Queen Beds and 2 single bunk beds, 2 x TVs + DVD player, free Austar TV, large balcony with outdoor setting, private BBQ + shade sail. 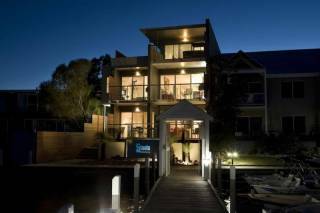 Metung Holiday Villas, is the latest offering of quality, affordable accommodation in Metung. This new refurbished four star resort opened in May 2005 and was bought by new owners in 2013. They have upgraded with new furniture, new toddlers pool, new linen and just a nice refresh of the park. We have a range of accommodation to suit all tastes and budgets. Each Villa is fully self-contained, all have reverse-cycle air conditioning, private balconies with outdoor settings, and in most cases, individual barbecues. Everything has been thought of to make your stay 'hassle free', including the provision of all linen, towels, etc. Villas have a comprehensive list of cookware items for those who want to 'stay in'. AUSTAR TV provided free of charge. A covered heated pool is available from September to April. Centrally located in the property is a children's playground, where the 'kidz' can safely play and burn off some energy. All of this is set under the canopy of beautiful trees and native terraced gardens. An easy 10 minute stroll will take you to the center of the Metung Village with its restaurants, bakery, cafes and waterfront hotel. At Metung Holiday Villas you have the best the Gippsland Lakes has to offer at your fingertips, so you can do absolutely everything or absolutely nothing. All of this combines to make an idyllic location for that 'weekend getaway' or your next 'family holiday'. Being Pet friendly, if any evidence of a animal being on bedding on furniture, an extra charge of between $50 and $100 will be charged to the card given on arrival. Please remember it is a privilege not a right to be able to bring your pet to Metung Holiday Villas. Early arrivals before midday will incur a $50.00 early check in fee. Room Rates – all rates are inclusive of 4 guests, unless otherwise stated. Any additional guest charges are to be paid direct to property. Boat Parking – Boats can be parked at Superior & Luxury Villas by request only. Limited boat parking is available with some Family Villas depending on their size. Pet Friendly: conditions apply. Please inform the staff you are bringing your Pet. Off-Season: we require you to pay a deposit of $100.00 at the time of booking, with the balance of the accommodation to be settled on arrival. You will receive a full credit less a service charge of $50.00, alternatively your deposit may be transferred in full to an alternative date within 12 months of the original booking. Cancellations advised within 90 days of booking date will be subject to a cancellation charge or forfeiture of full deposit/payment if we are unable to relet the full period of the booking. In the event that you do not arrive on the specified date of arrival, the full amount of any outstanding balance will be charged to your account.